The Main Shop is the largest, most varied shop in Dragon Mania Legends. It can be accessed from the main screen using the button in the bottom right corner. There are a total of six tabs that can be navigated through and each tab features a different category of items for sale. The items within each category are listed in their own order with all of the items that are not yet unlocked being shown at the end of the list. This tab lists a vast number of the Dragons that are currently in the game. The Dragons displayed here include all of the Normally-Breedable Dragons, VIP-Exclusive Dragons, regularly available Card-Segment Dragons, Boss Dragons that have been defeated in the Normal Mode of the Campaign Map, all ongoing limited-breedable Dragons, and any current limited Card-Segment Dragon (those for which at least one Dragon Piece was found are visible in the shop). Any Dragons of which the Trainer does not have at least a species housed on their islands is shown first, followed by Dragons the Trainer does have and the followed by Card Dragons for which the Trainer has at least 1 Dragon Piece, but does not have them housed on the island nor has sufficient Dragon Pieces to hatch them. All groups are sorted in a combined order of availability, Elements and rarities. Dragons can be filtered by pressing the button. This will bring up a window from where the Trainer can choose to view Dragons by (default view), VIP Dragons, Boss Dragons, Card Dragons, or any Element. Additionally, the Trainer can choose to search for a Dragon by their name using the search bar above the selection of filters. The snapshot of Dragons varies in accordance to their Elements, rarity, and method of obtaining. All snapshots display the Dragon and its name underneath it, its Elements underneath its name, its rarity in the top-right corner of the snapshot, and the option in their top left corner (choosing this option will show the base Codex Entry of the featured Dragon). Dragons that the Trainer currently has on their islands have a mark just above their name. The second and third Element of Legendary and Divine Dragons are not shown unless they are awoken for those that are on the Trainer's islands, and the icon will be displayed in place for each unawoken Element. Dragons that can be purchased in exchange for Gems will have a green button under their Elements showing the necessary amount and the icon in the right of it while those that can be purchased in exchange for Gold will have the same display but with the icon instead. Pressing the former button will bring a pop-up window where the Trainer will be asked to confirm their choice of purchasing the Dragon while pressing the latter button will instantly buy the selected Dragon. Any current limited-breedable Dragon will display its remaining time under its snapshot. For the vast majority of Dragons, the color of snapshots is made up by the border colored the same color as the rarity of the Dragon and a much more lighter background of the same color. The only exceptions to this are the following three: Divine Dragons which have as a background a cloudy landscape and two embellishments at the bottom corners of their snapshot; Card Dragons which have as background a natural landscape; Boss Dragons which have a light black border with a light purple background. Dragons that are not yet unlocked will have their snapshot grayed out and the level the Trainer needs to reach to unlock it will be shown at the bottom of the snapshot on the notice. In case the Dragon is unavailable for purchasing until Quest 2 (Mountain Trail) in Normal Mode is defeated, the notice is displayed instead. VIP Dragons that are not yet unlocked will have the button under their Elements indicating the necessary level inside the badge and the Reach VIP level # (where # stands for the necessary level) text will be displayed across the middle of the snapshot. Pressing the button will take the Trainer to the VIP interface. VIP Dragons that are unlocked while the Trainer has no active VIP status will have this exact button under their Elements, the icon under their rarity indicating at which VIP level that Dragon is unlocked, and the Activate VIP text across the middle of the snapshot. 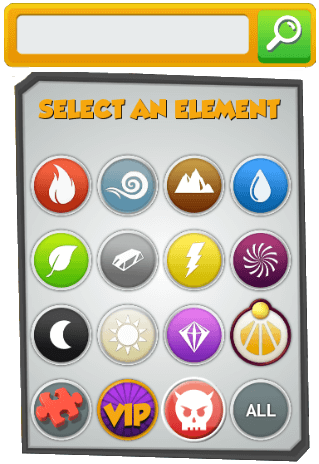 All Card Dragons display, to the left of their Elements, the current amount of Dragon Pieces the Trainer has for them separated by a / mark from the total amount that is needed in order to obtain one Dragon. Additionally, they can have three different buttons depending on their current availability. Dragons for which the Trainer has enough Dragon Pieces to hatch will have the button under their Elements and pressing it will place the Dragon in the Hatchery, provided there are free nests available. Dragons for which the Trainer does not have all the Pieces will have the button in the same place and pressing it will take the Trainer to wherever Pieces for them can be obtained. Dragons that are currently part of an ongoing Castle Event will have the button in the same place and pressing it will take the Trainer to that event's interface. Dragons that can not currently be obtained in any way whatsoever, or at least not in a way the Trainer can get involved directly, will have no button and will have the Not Available text under their snapshot. 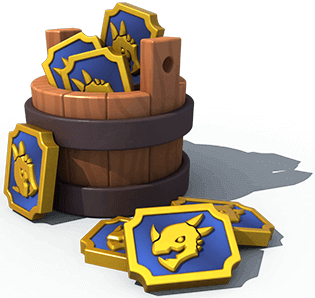 Dragons whose Pieces can only be found in card packs obtained in The Great Dragon Race event milestones will have the Clan Reward text under their snapshot, regardless if they can currently be obtained or not. 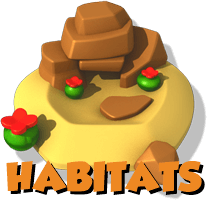 This tab lists all the Habitats that can be purchased in the game in order from lowest to highest Element, with the Boss Habitat at the end. Each Habitat that the Trainer has unlocked through leveling has a snapshot having the same color as the snapshot for Epic, Non-Card Dragons, while Habitats that are not yet unlocked will have their snapshot grayed out and the level the Trainer needs to reach will be shown at the bottom of the snapshot. On each snapshot, there is the same number showing the total amount of Habitats that are on the islands separated by a / mark from the same number showing the maximum amount the Trainer can currently have. In the top-left corner of each snapshot, the button can be pressed to display the Habitat's description, the amount of Dragons it can hold and (where applicable) its maximum Gold capacity (both values are for Level 1 Habitats). The description is given underneath the name of the Habitat, below which a button with the cost and currency is shown (Gems for Boss Habitats, Gold for the rest of the Habitats). If the Trainer has reached the limit for building Habitats, the notice will be shown instead and the snapshot will be grayed out. When the purchasing button is available, pressing it will take the selected Habitat to the closest free spot on the islands, if there is any available square space, and the and options will be shown to cancel or confirm the position of the Habitat, respectively. Selecting the former will not take the Trainer back to the purchase screen while selecting the latter will confirm the purchase and deduct the necessary cost from the Trainer's stockpile. Both options will still be available if there are no free spots to place them, but only the former button can be pressed while the latter will be grayed out. This tab lists all the purchasable buildings in the game, with the exception of the Habitats. Each building that the Trainer has unlocked through leveling has a snapshot having the same color as the snapshot for Habitats, while buildings that are not yet unlocked will have their snapshot grayed out and the level the Trainer needs to reach will be shown at the bottom of the snapshot. On each snapshot, there is a number showing the current amount of that type of building that are on the islands, separated by a / mark from the number showing the maximum amount the Trainer can currently have (there can be only one of each building, with the exception of Farms which are limited to a maximum of fifteen). In the top-left corner of each snapshot, the button can be pressed to display the building's description. Underneath the name of the Habitat, the same description is given and underneath it, a button with the cost, and the icon is shown. If the Trainer has reached the limit for a particular building, the notice will be shown instead and the snapshot will be grayed out. When the button is available, pressing it will take the selected building to the closest free spot on the islands, if there is any available square space, and the and options will be shown to cancel or confirm the position of the building, respectively. Selecting the former will not take the Trainer back to the purchase screen while selecting the latter will confirm the purchase and deduct the necessary cost from the Trainer's stockpile. Both options will still be available if there are no free spots to place them, but only the former button can be pressed while the second will be grayed out. Additionally, the button is shown for buildings of which the Trainer can have only one, whenever these are present on the islands. Pressing it will take the Trainer to that building and the arrow will be displayed atop it. 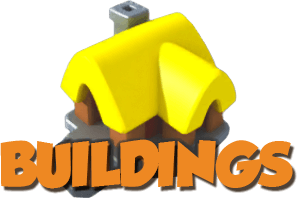 The order of the buildings starts with the limited-time building (if any), then the Dragon Vault, the Gold Vault, the Farms, the Fountain of Youth, and the Temples ordered by their Element from lowest to highest. While Farms are unlocked at Level 2, there is a limit to how many Farms a Trainer can have which increases at certain levels. Whenever that limit is reached, the necessary level needed to be reached by the Trainer in order to build more Farms will be shown under the description for Farms. When the maximum limit of twelve Farms is reached, the same notice will be shown that is shown for other buildings. Farms both in the inventory and on the islands count toward the limit. 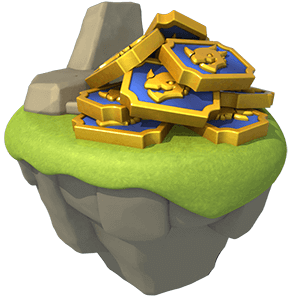 The Gold Vault is the only building that depends on the Trainer's VIP Status in order to be available for buying. If the Trainer's VIP membership is inactive, the Activate VIP text will be displayed across the middle of the Vault's snapshot and the button will be shown under its description. Pressing it will take the Trainer to the VIP interface. Any time-limited building that is released to the game will also be shown here and will have the button underneath the name in place of the button, and pressing it will take the Trainer to a window where the description is shown along with its cost and the Trainer's local, real currency. This tab lists the vast majority of the purchasable decorations that are currently available in the game. Each decoration that the Trainer has unlocked through leveling has a snapshot having the same color as the snapshot for Habitats and buildings, while decorations that are not yet unlocked will have their snapshot grayed out and the level the Trainer needs to reach will be shown in the bottom of the snapshot. The size of each decoration is shown in its snapshot and varies from small (1x1), medium (2x2) and large (3x3). Under the size, a button with the cost and the icon of the currency (either or ) is shown. Pressing it will take the selected decoration to the closest free spot on the islands, if there is any available square space, and the and options will be shown to cancel or confirm the position of the building, respectively. Selecting the former will not take the Trainer back to the purchase screen while selecting the latter will confirm the purchase and deduct the necessary cost from the Trainer's stockpile. Both options will still be available if there are no free spots to place them, but only the former button can be pressed while the second will be grayed out. Decorations can be filtered by pressing the button and selecting one of the four categories. 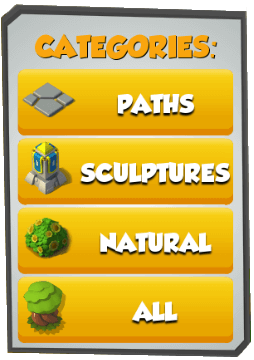 The first category will display only decorations that have the appearance of paths, the second category will display sculptures, the third category will display natural decorations, and the last (and default) category will display all the decorations combined. This tab lists most of the promotions, packs, and bundles that are offered in the game, either through real currency or Gems. 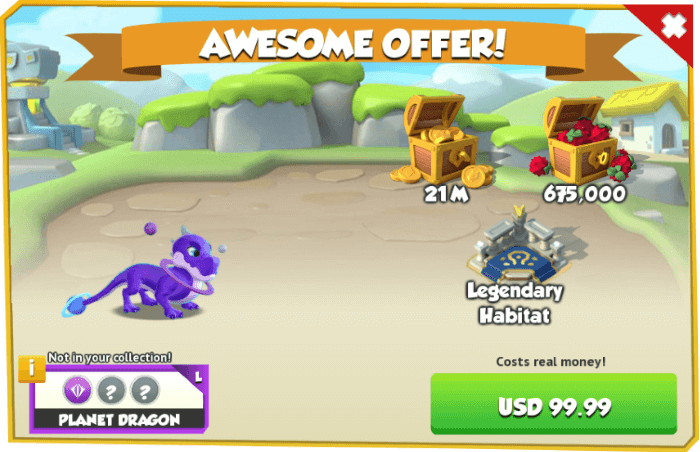 These promotions include Dragons, Scrolls, Gold, Food, Gems, Dragon Fury Essence, VIP Tickets, Habitats and/or, occasionally, time-limited in-game currency. All promotion snapshots have a yellow border with a landscape background. Each snapshot contains the name of the promotion, depictions of what it offers, the price (in the top-right corner), and the button. Promotions that are currently available for an indefinite time have the price displayed over a green background while limited-time promotions have it displayed over a red background. Additionally, promotions that are offered with a discount display the percentage in the top-left corner. Pressing the aforementioned button will open up a window where the exact amounts of each feature can be seen, the button to purchase the promotion with the price and currency displayed on it (and the message Costs real money! above it if the promotion is sold in exchange for real currency). If there is also a Dragon on offer, the option will be displayed, as well, and can be pressed to bring up the Dragon's Codex entry. Under this button, a box with the Elements and rarity of the Dragon is displayed. If the Trainer does not have the Dragon in their collection, the Not in your collection! text will be shown above the box. Time-limited promotions will also display the time left just under their name and the purchase button will show the old price above the new one marked by a strikethrough, as well as the discount percentage. When only Dragons are offered, the snapshot that appears in the Dragons tab will be shown instead and the purchase button will show the old price above the new one marked by a strikethrough while the discount percentage will be shown next to the Dragon. Whenever there is a limited-time promotion, the sign will be shown both on the tab itself and the button for accessing the Main Shop (the sign can also appear on other tabs if a promotion occurs there). Additionally, the time left for the shortest promotion will be shown above the tab. Outside the main screen, the tab will be displayed in the bottom-middle of the screen (and will indicate the time left for the promotion that it features) and pressing it will take the Trainer to the bundle or pack that will expire the soonest. Closing the window will take the Trainer to the Promotions tab rather than back to the main screen. Also, under the Trainer level (and under the event bar if there are any ongoing events) the tab will sometimes be displayed indicating the time left for the promotion that it features and pressing it will take the Trainer to a promotion that is either offered in this tab, or in a different place in the game. 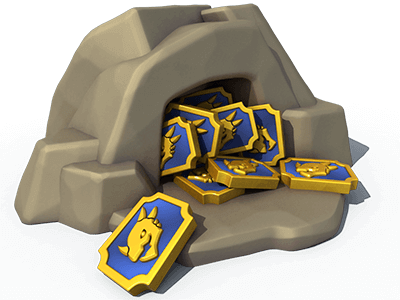 Whenever something else other than Dragons are featured as promotions by the latter tab, the tab will display the image of the featured item instead of the winged chest (example: ). This tab lists the three regular card packs for purchase as well as the current Dragon on rotation for Weekly Dragon Pieces. The snapshot for the Weekly Dragon Pieces has a predominantly purple color with a landscape background, the notice above the snapshot, and the time remaining is displayed at the bottom. The amount of Dragon Pieces the Trainer has collected is separated by a / mark from the total amount of Dragon Pieces needed to obtain it. The button displayed in the corner of the snapshot can be pressed to bring up the base Codex entry. Card Dragon Pack Tickets can be bought individually or in a bundle in exchange for Gems. Purchasing these tickets activates a confirmation window pop-up and the user has to confirm the choice by pressing the button. These tickets can also be earned through the Whale-Mart and Dragon Collector Leaderboard, various events or other occasions. The snapshots of the card packs have the same coloring as those for Habitats have. Each has a small description and the purchase button showing the price and currency for the card pack (750 for One-Card Packs, 2,500 for Three-Card Packs, and 4 for Five-Card Packs). Additionally, on the right-hand side of the snapshot, the button can be pressed to bring up a visual depiction of the Dragons whose matching Dragon Pieces can be obtained from that pack and an another button which, when pressed, will display an official list of drop rates of Dragon Pieces by rarity. 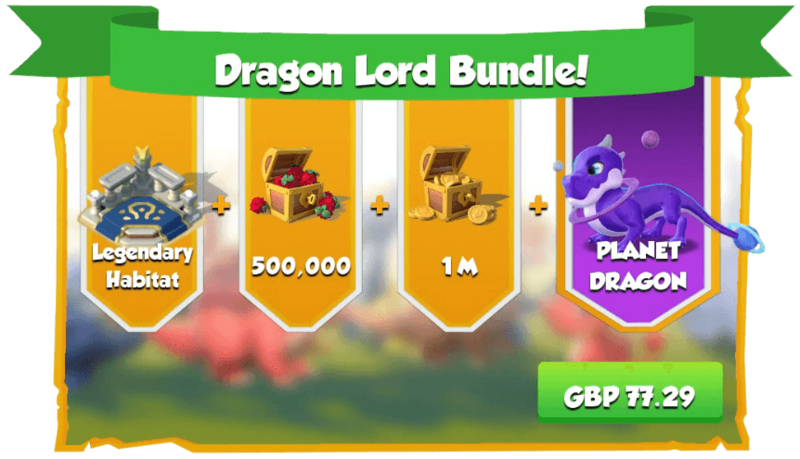 Any Dragon that is offered on a promotion is shown first, with the weekly offer being shown second, then the other Dragons ordered by rarity. Each Dragon has, above its image, the amount of Dragon Pieces collected for it separated by a / mark from the total amount of Dragon Pieces needed to obtain it, and the button that displays its Codex entry when pressed. 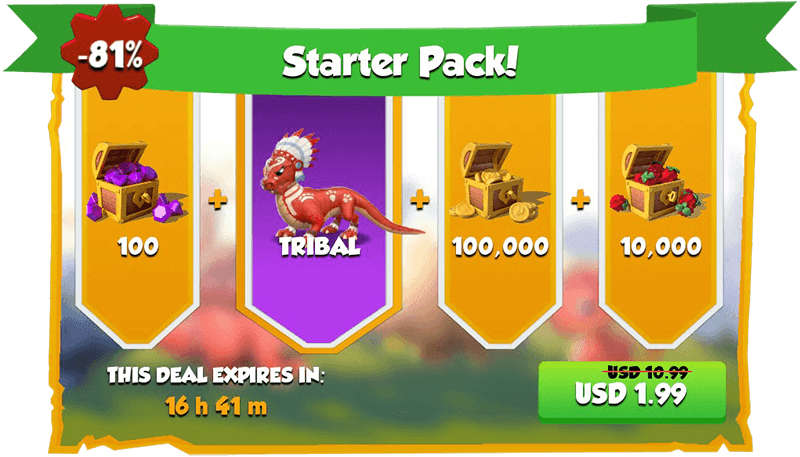 Under the images of the Dragons, the option will be shown and will display the cost and currency of the selected pack. The One-Card Pack will instead have the option if a video is available for it. The One-Card Pack can be obtained for free every 12 hours through watching a video and whenever the option is available, the video must be watched in order for the Trainer to be able to purchase more packs of that kind. 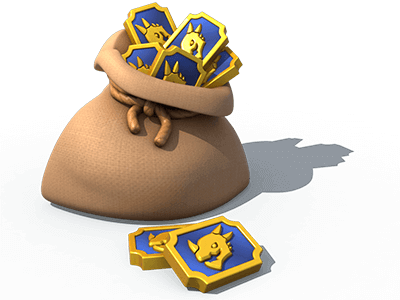 The Trainer must be Level 12 in order to be able to purchase the One-Card Pack and the Five-Card Pack while Level 25 is needed for the Three-Card Pack. When any of the card packs are level locked, the notice (indicating the necessary level) will be shown instead of the purchase button. When any card pack is purchased, it must be continuously tapped until it opens. After that, either the button (for the One-Card Pack) or the button (for the other two) will appear and pressing either will flip the cards face-side up displaying for which Dragons the Trainer obtained Dragon Pieces. 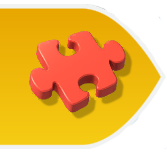 Selecting the option will collect the Pieces and close the window. Occasionally, a separate Five-Card Pack having the chance to give Pieces for a limited Card Dragon (in addition to the other Dragons) or an increased chance for one of the regular Dragons may be on offer and it will be listed under this tab, next to the weekly offer. Its snapshot has the same color as the one for card packs along with a unique notice above it. Additionally, the snapshot will have the image of the Dragon on offer and the time left until the offer expires. As with all the other card packs, pressing the button displays the same selection of Dragons found in the other packs, but includes the promoted Dragon, which is shown first. This card pack costs 6 . Lastly, from here, the Trainer can select the option which will take the Trainer to the Dragons tab and will filter the view by . The official drop rates for Dragon Pieces by rarity for each pack are officially stated by Gameloft through the after displaying the contents of any card pack. The list was last updated on the 23rd of July 2018 and the displayed amounts below show the average number of cards obtained in every 100 packs opened. Update 4.0 changed the background color of Boss Dragon snapshots from purple to orange. Starting with this update, Card Dragon Pack Tickets can also be purchased in increments of 100 and 45 in addition to 10 and 1. Update 3.7 implemented the possibility of obtaining Card Dragon Pack Tickets through the newly-introduced Whale-Mart. An additional button has been added to the inside of Card Packs which is used to display an official list of drop rates. The button has been replaced by the button. The game's main font, Grobold, has been slightly sharpened. Except for VIP Dragons, the other snapshots of Dragons no longer have the additional text that appears on some of them, such as the time left for a limited Dragon or Not Available for some Card Dragons. Instead, these have been moved underneath them. Bundles no longer have their name displayed inside their own window, all having been replaced with the generic Awesome Offer! text. Most bundles no longer have the same background with some of them receiving a personalized one. Bundles that offer Dragons will now display the Elements and rarity of said Dragon when accessing these bundles, without having to open up the Dragon's Codex Entry. Additionally, the Not in your collection! text is now displayed over these characteristics. When opening a bundle window, non-Dragon resources will no longer appear instantly, but in a fade-in motion. Update 3.4 introduced a yellow-bordered, white background for the Card Dragon Pack Tickets. Update 3.3 replaced Gems with Card Dragon Pack Tickets as the means for buying the Five-Card Pack. Before this update, the cost of buying this pack was 100 Gems and the cost of buying the limited version of it was 150 Gems. The button was replaced by the button and the button was replaced by the button. Update 3.2 added the button to buildings that the Trainer can have only one of each. Update 3.1 slightly altered the order of the Dragons tab. Update 3.0 replaced the tab with the tab. 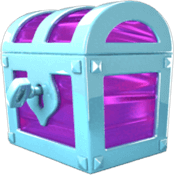 The icon, which indicates an ongoing offer or promotion and appears on the button for accessing the Main Shop or on the various tabs found inside, has been replaced by the icon. Update 2.9 altered the top-left promotion tab to display the promoted item instead of the flying chest whenever anything other than Dragons is promoted. Update 2.8 brought graphical changes to the background of the individual promotions. Update 2.7 replaced the button with the tab and moved it to the top-left part of the screen. Additionally, the button was added in the corner of the snapshots for card packs. Update 2.1 introduced the option to search Dragons by their name. Update 2.0 added the Card Packs tab and the option to filter Dragons by as part of the introduction of Dragon Pieces. Update 1.9 altered the snapshots for promotions so that they now display the items featured in the bundle instead of only showing a chest. Additionally, their background is now over a natural landscape. Update 1.8 added the option to filter Dragons by as part of the introduction of VIP-Exclusive Dragons. The and tabs were replaced by the and tabs, respectively. 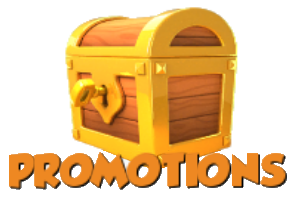 Update 1.3 changed the icon of the Promotions tab from the previous one with the current one. 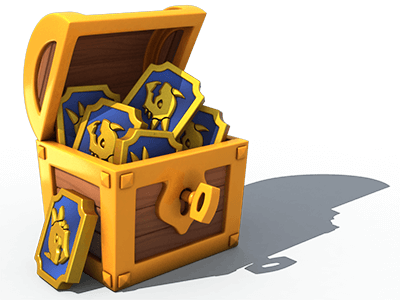 Update 1.2 added the Decorations tab as part of the introduction of decorations and replaced the icon of the Promotions tab of the icon with the chest.